If you are planning to do a home remodeling project we can help. We are familiar with Eagan and have provided home remodeling services, house plans and house design services to many of your neighbors. Whether your project is a kitchen, addition or major renovation we will provide you with valuable ideas, insight and a detailed remodeling plan that will make the project easier to build while insuring that you will be pleased with the outcome. The most successful Eagan home remodeling projects are always the result of the having effective communication. We will carefully listen to you while making sure that we understand what is most important to you. Design is done in stages so you are comfortable with the process and we never go to the next step without your approval. Our guarantee is that we will continue to work on the design until you are happy. This is how we have done it for our clients in Eagan Minnesota since 1988. Your choice in a kitchen designer is a big decision. Choose a company you can trust for professional design, service and consultation on one of your biggest investments-your home. Choose Hallquist Design! 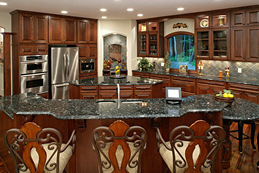 According to Realtors in Eagan, Minnesota, kitchen remodeling will add more value to your home than any other project. Most real estate agents agree that kitchen remodeling is the single most important project for adding sales appeal to your home in Eagan. Your dreams can be achieved with kitchen remodeling. We will be able to show you kitchen remodeling ideas and design options until you are completely happy and confident it's the right kitchen for you. Many times kitchen remodeling projects impact adjacent rooms. It is important to design all of the rooms working together as one to insure unity; a professional house designer familiar with Eagan will help with this. Kitchen remodeling in Eagan may incorporate opening up the kitchen to other rooms with a large multi-function island, state of the art appliances and granite counter tops. 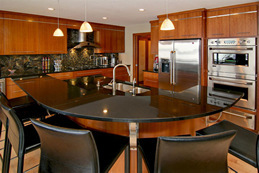 Please call Hallquist Design for a free consultation and lots of kitchen remodeling ideas. According to recent real estate statistics you will recover 75-80% of your Eagan basement remodeling investment upon resale. 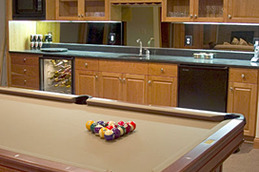 We will take your ideas and add our design experience to develop a professional plan for your Eagan MN basement remodeling. Hallquist Design will show you how to achieve the most from your space with creative design solutions and solid planning while showing you ways to save money. Many of our clients have commented that having us do a professional design for their Eagan basement remodeling project helped them achieve exactly what they wanted plus much more! Please complete the form below to receive information on how we can assist your Eagan home design and remodeling plan needs. Interested in Modern Farmhouse Plans? See more of our custom home design and remodeling projects.